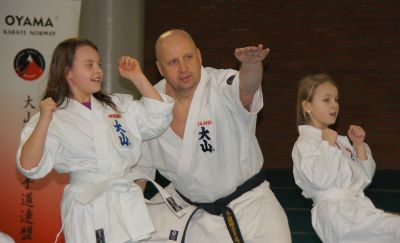 Shihan Rafal Majda during the training. Between January 15-18 2017, Ekeberg Idrettshalen Sports Hall - Main Dojo of the OYAMA Karate Norway, hosted a schooling-qualifying seminar organized by Sensei Wojciech Piątas 1st dan. Training was conducted by Vice Chairman of the Board of OYAMA IKF, Shihan Rafal Majda 5th dan. The main topic of the clinic was fighting tactics and pad workout. Exam was conducted in two groups, one for the children and one for adults. Participants arrived from sections in Ekeberg and Ris. Sempai Artem Fayzullin, our fellow doctor from Oslo University Hospital took care of the medical support for the participants of the exam. All students presented a high level of technique and were promoted by Shihan Rafal Majda to higher belts. OSU! Before the exam Sensei Piatas presented commemorative statues for the people who directly helped to setup a Dojo in Norway. Statues were give to: Shihan Rafal Majda, Mrs. Aleksandra Wites - Piatas, Sempai Dariusz Salamaga and Sempai Marek Mikolajczyk. OUR SINCERE CONGRATULATIONS AND WE WISH YOU FURTHER DEVELOPMENT, OSU!